Born Dorothee Pesch in Dusseldorf, Germany, Doro Pesch has been a mainstay of hard rock and heavy metal for over 30 years. Most notable for her lead role in the 80’s hard rock band, Warlock, Doro has enjoyed success in the industry, releasing 16 studio albums to date. While Doro has been more active with touring in Europe over her many years in the business, she continues to live and record in the US.With her take no prisoners attitude and raw musical talent, she continues to be a major influence for women in heavy metal.‘Powerful Passionate Favorites’ is a bonus CD released in a 30th Anniversary package along with a re-release of Doro’s successful outing, Raise Your Fist, consisting of new and previously unreleased tracks, along with cover versions of some of her favorite artists. The album opens with “It Still Hurts”, a ballad-esque duet with the iconic Lemmy Kilmister of Motorhead,billed as The Ballad of Doro and Lemmy. Doro‘s voice lends perfectly to the ballad format, but it’s just a little odd hearing Lemmy‘s voice in the same fashion. “Leve Ton Poing Vers Le Ciel” is the French version of previously released “Raise Your Fist In The Air”. Doro‘s distinctive vocals shine through to make the song enjoyable without having to understand what she’s saying.Unless of course, you speak French.Doro‘s version of the Led Zeppelin classic, “Babe, I’m Gonna Leave You”, is quite good despite the listener possibly being sick to death of hearing it by the original artists. She delivers a breathy opening building to an all out scream which waxes and wanes throughout, sounding pretty close to Robert Plant himself. “Nutbush City Limits” posed an educational experience for me having never heard the original Tina Turner recording. Upon a little research to become familiarized with the song, it’s obvious that Doro adds a little metal spice to the 70’s era funk-style jam.“Only You” is a rocking love song originally written for Doro by Gene Simmons back in 1990. This is billed as a new version of the track yet still sounds heavily influenced by the writer’s band. Opening with Doro‘s signature vocal sound and a single guitar, it eventually descends into an 80’s inspired ode to “only you”. “Egypt (The Chains Are On)” is a cover tribute to the late great Ronnie James Dio. While Doro‘s vocals may not be quite as strong as Dio‘s, she still does fair justice to the song, keeping fairly close attention to the original. 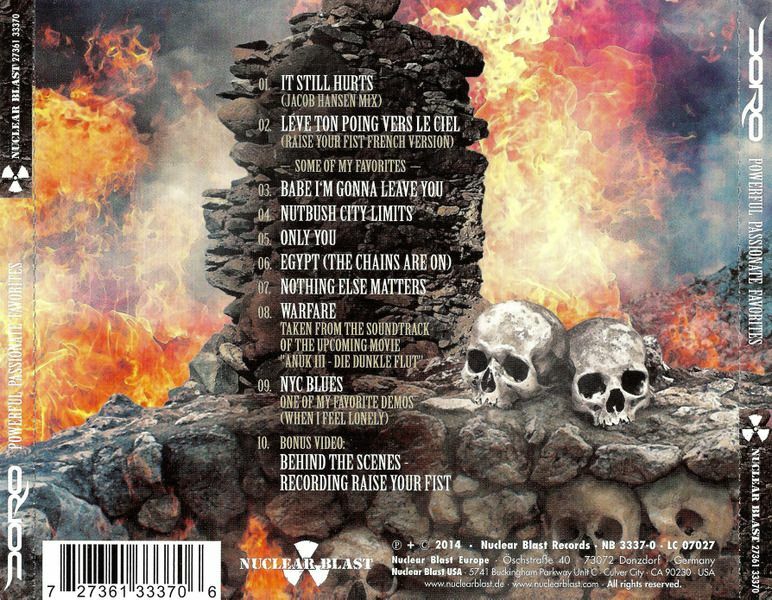 The song does seem to run longer than it needs to, but the quality of Doro‘s band makes it slightly more palatable.“Nothing Else Matters” is yet another cover, this time paying tribute to what many consider the breakout album, but at the same time the beginning of the downfall, of metal giants, Metallica. 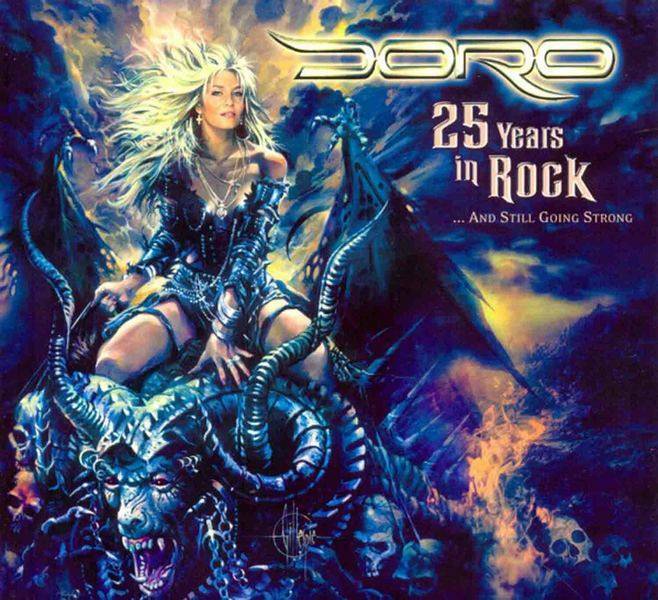 Doro puts her own spin on the song as the opening sounds a bit different than the Metallica version,but throughout the song, her vocals tend to get a little lost in the heavy orchestral background. “Warfare” is a new track being featured in the sequel to Anuk: Der Weg des Kriegers,titled Anuk II, a Swiss made adventure movie co-starring Doro in the role of Meha. With a driving drum beat and added vocals during the chorus,it gives the sense of an army marching to war. The album is rounded out with “NYC Blues”,a demo version of a new track recorded at Doro‘s home in New York. This is very definitely a blues song. Not much metal going on here. I used to want to live in New York until I heard this song. You really have to be a fan of Doro to like this track.After having heard the entire album, it sounds very much like a passion project. The covers are some of the most iconic works of equally iconic bands. While they may not be as strong as their predecessors, Doro still adds elements of her own style making them truly hers. The new tracks are solid with tons of obvious inspiration culled from a long and successful career in hard rock/heavy metal. There’s a reason she’s known as the Metal Queen. 2010 German Nuclear Blast label 3-disc DVD/CD box set celebrating ex-Warlock singer, Doro Pesch's, 25 years as heavy metals undisputed rock goddess. 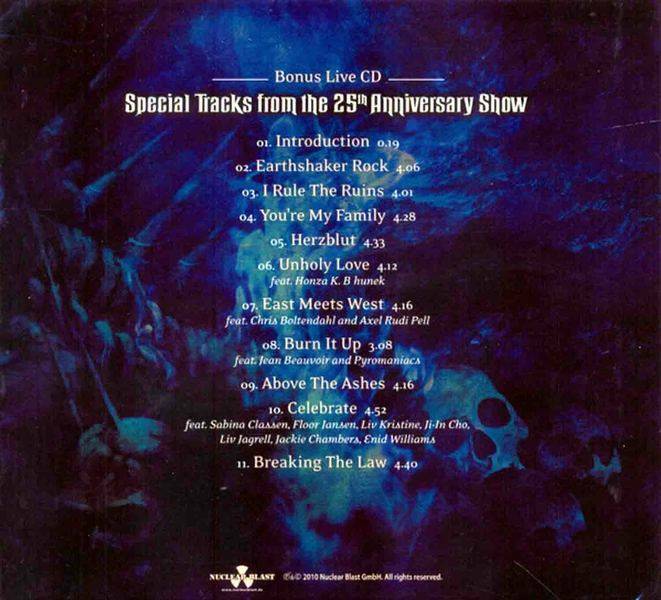 The box set features the entire 25-year anniversary concert, including guest performances in front of about 10,000 enthusiastic fans in Düsseldorf, Germany, with guest performaces by Overkill's Bobby "Blitz" Ellsworth, Jean Beauvoir, Grave Digger's Chris Boltendahl, guitarist Axel Rudi Pell, former Nightwish singer Tarja Turunen, Scorpions' Klaus Meine and Rudolf Schenker, Leaves' eyes Liv Kristine, After Forever's Floor Jansen, members of Girlschool, Liv of Sister Sin and Sabina Classen of Holy Moses.The box set also includes a documentary DVD featuring a China special, outtakes from Doro's 2500th concert, live excerpts from various venues 2005 - 2010 including and TV specials - also comprising a bonus live CD from the 25th Anniversary Show.DVD's, CD's and photo book are kepts in nice digipak picture covers - everything held in a texture card picture slipcase box.